Maria Robinson, owner, is an award-winning graphic designer known for executing creative but functional results. 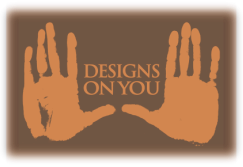 After 24 years in corporate marketing, she launched Designs On You in 2011. Maria has an Associates Degree of Occupational Studies in Advertising Design from the Art Institute of Colorado. has been sorely missed. The commitment I make to my clients is to find the relevant tool in the box and apply it in the right balance of presence to maximize the value of your written and visual communications. I won't design you into a corner and out of your budget. From the outset we'll discuss your goals and discover the path together that meets them on time and in budget. Maria's work has been honored with more than 70 design awards including Best of Show IABC Bronze Quill Awards, Business Marketing Association, American Marketing Association, International Association of Business Communicators, Dalton Pen Communication Awards. Maria has been recognized by her customers, peers and managers with Achievement Awards for Teamwork, Leadership, Service Excellence, Productivity, Efficiency & Organizational Skills, and Cost Savings.